BUCKLING under pressure from the power and mining industries and the Prime Minister’s Office (PMO), the Union Ministry of Environment and Forests has eased clearance norms for expansion of coal mining projects. On December 19, the ministry issued an office memorandum, allowing existing coal mining projects to skip the process of public hearing, a prerequisite for obtaining environmental clearance, for one-time capacity expansion of up to 25 per cent. With this memorandum, the ministry has reversed its stance. In August 2009 the ministry issued a notification, making public hearings must for the expansion of all existing projects. The order did not go down well with the industry, which has since been pushing the government to tweak the law for enhancing coal production. In 2011, to augment power production, a committee headed by Planning Commission member B K Chaturvedi recommended holding public hearing once, just before starting mining activity. Subsequent expansions, that did not have any change in the mining plans, could do without further public hearings, it suggested. In July 2012, PMO asked the ministry to exempt expansion of coal mining projects from public hearing processes. Says Manoranjan Hota, director (environmental clearance) at the ministry, the exemption is applicable for the expansion of only those projects that had conducted public hearings to obtain environmental clearance. Though the expansion limit is 25 per cent of the capacity of the mine, the project proponent would be allowed to extract an additional 2 million tonnes per annum (MTPA) if it plans to transport coal by road, and 5 MTPA in case the mined coal is transported by a conveyor belt or the railways. The ministry memorandum, however, does not specify what would happen to the water resources in the event of an expansion. “Any change in the capacity of a mine would impact the ecology of the area. Even in areas situated deep inside the forests without human habitation, mining has adverse impacts on the wildlife,” says Ravi R Pragada, secretary general of Mines, Mineral and People, a pan-India, non-profit organisation of people affected by mining. Pragada explains that groundwater extraction increases with increased mining activity. So do overburden dumps that choke the streams. Ministry officials say expansion of mining capacity would not hamper ecology as it does not allow increasing the mining lease area. Further, Hota says, if the mining company changes the mining method, for instance, from open cast mining of coal to underground mining, it has to apply for a new environmental clearance which will entail a public hearing. The system of public hearing was introduced in the environmental clearance process in 1997 and is considered a democratic platform where people can express their concerns about a development project proposed in their area. “Thus the move to exempt coal mine expansion from public hearing is undemocratic,” says Pragada. It will further pave the way for other sectors to make similar demands, he adds. Environmental lawyer Ritwick Dutta says the process of dilution of public hearings is very much in practice. Earlier, even construction of buildings and shopping malls would require public hearing before they are granted environmental clearance. But the EIA notification in 2006 did away with it, he adds (see ‘Why the flip-flop?’). Public hearings are already regarded as farce not only by civil society groups and project-affected people but also by the National Green Tribunal. In April 2012, responding to an appeal filed against a coal mining project of Jindal Steel and Power in Chhattisgarh’s Raigarh district, the National Green Tribunal remarked that the public hearing was fixed in favour of the project developer. “During the hearing, the supporters of the project were paraded one after the other only to say one word, ‘I support’. The persons who supported the project all appeared to have been brought and prompted by the proponent. It was a mockery of the entire process of public hearing,” the tribunal remarked. “The Jindal case is just one instance out of several hundreds of public hearings, when a court ruled in favour of the people opposing a project,” says Dutta. In most cases, project proponents tweak the terms of reference or give false assurances to the people to obtain environmental clearance. Says Raghuveer Pradhan of Adivasi Ekta Parishad, a Chattisgarh-based non-profit working on land rights, until NGT’s order in the Jindal case, project proponents used to conduct 40 to 50 public hearings in Raigarh every month last year. These hearings were conducted amid heavy deployment of security forces. People fail to negotiate with the company and local administration present at public hearings because they are mostly unaware about what to ask, Pradhan says. So they end up discussing about compensation or their own problems for which false assurances are made. When villagers talk about the social impact of the projects, the officials often brush their concerns aside, saying one is supposed to talk only about environmental impacts, he adds. People are losing faith in public hearings, says Vijay Taram, convenor of Forum for Siang Dialogue, a non-profit in Arunachal Pradesh’s Pasighat district. About 180 hydro power projects are planned in Arunachal Pradesh, for which the process of public hearing was initiated last year. Taram says people in the state are opposed to these projects. They did not want to participate in public hearings. So when the government held a public hearing despite their opposition, they staged protests and blocked roads leading to the venue. Hazaribagh in Jharkhand witnessed at least two such instances in the past year, in which the police lathicharged the participants of public hearings. In one instance, the residents of Karanpura town were opposed to coal mining project, a joint venture of Eastern Minerals and Trading Agency and the Jharkhand government, and were protesting at the public hearing. In the other instance, people opposed the choice of public hearing venue, which was far away from the affected villages. According to Virendra Kumar of Naya Savera, a Hazaribagh-based non-profit, in November last year Reliance organised a public hearing for its mine in Bariyata village in Hazaribagh town, which is 45 kilometres away from the mine site. “We opposed and said none of the villagers from 49 villages to be affected by the mining project would participate in the hearing. As per the environmental impact assessment (EIA) rules, public hearings must be conducted in the villages or nearest block development office. The project proponents said that since the proposed mine site is a Naxal-affected are, there was a security threat to the hearing,” says Virendra. When Virendra and 150 others went to Hazaribagh, police apprehended them five kilometres from the site of the public hearing. “There were only a bunch of local contractors attending the hearing who would have benefited from the project,” he adds. The Punjab government went one step further last year by holding public hearings to legalise illegal sand and stone mines in Ropar district (see ‘Punjab slips for sand mine, again’, Down To Earth, July 16-31, 2012). This was despite the fact that the mines have taken a toll on riverbeds and village commons and people were opposed to it. APRIL 10, 1997: The process of environmental public hearing (EPH) was introduced in the environmental clearance process under the environment impact assessment (EIA) notification of 1994 for developmental projects. State Pollution Control Boards (SPCBs) were asked to conduct public hearings to get the views and concerns of the affected community and interested parties for proposed projects. SPCBs were also entrusted with forming an EPH committee to ensure fair representation of people in the public hearing process. JUNE 13, 2002: An amendment was introduced to the EIA notification, which allowed expansion or modernisation projects with less than Rs 50 crore investment to skip public hearing. The amendment also exempted new projects with less than Rs 100 crore investment from public hearing despite their huge environmental and social impact. SEPTEMBER 2003: The EIA notification was further amended, allowing offshore exploration activities, beyond 10 km from habitations and ecologically sensitive areas, to skip public hearing. JULY 4, 2005: Expansion or modernisation of nuclear power and related project, river valley projects, ports, harbours and airports, thermal power plants and mining projects with a lease area of less than 5 hectares could be taken up without prior environmental clearance. This means such projects do not need public hearings. SEPTEMBER 15, 2006: New EIA notification comes into force, which exempts building, townships and area development or construction projects from holding public hearing. AUGUST 24, 2009: The Ministry of Environment and Forests (MoEF)Ã”Ã‡Ãªmakes public hearing mandatory for expansion of any existing project, including the ones cleared before the new EIA notification of 2006. 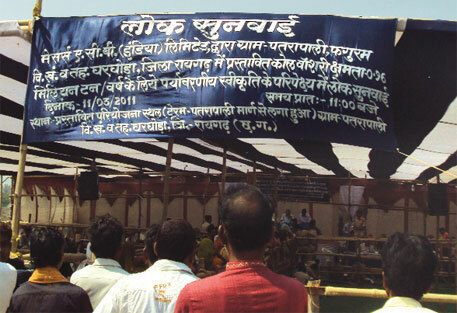 APRIL 19, 2010: After a court order, MoEF revises the conditions of public hearing, asking project proponents as well SPCBs to provide adequate time and information about public hearing to project-affected communities. DECEMBER 19, 2012: MoEF issues an office memorandum, allowing coal mining projects to skip public hearings for one-time capacity expansion of 25 per cent.